The God of prophecy is full of surprises. Do you know anyone who predicted the hunt and hanging of Saddam Hussein? Or, the arrival of the Arab Spring? Or, Bashar al-Assad running for his life? Are there more surprises ahead? In the world of eschatology, one needs to maintain some degree of flexibility! Bill Salus, the author of Isralestine and Revelation Road is full of surprises and for some, a few shocking new ideas. 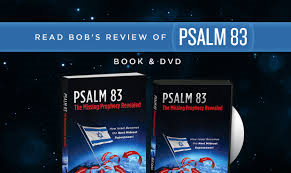 He has written a timely new book on what some are calling “The War Prophecies.” Bill’s book, Psalm 83: The Missing Prophecy Revealed, takes the position that there is a major regional war on the horizon in the Middle East. He believes Israel will be victorious, first destroying the Islamic threat and then acquiring large amounts of enemy land and great wealth—all after battling and destroying a ten-nation Arab confederacy. Will tiny Israel become a Mideast superpower as Salus suggests? Could this be the reason why Ezekiel describes Israel as dwelling securely in a land of unwalled villages in the latter days? When was the last time Israel felt secure in her Land? Something must change in the days ahead. This is no doubt the most important book to come along in a long time. It’s a highly documented study of a soon-coming prophetic event that very few people are anticipating. Based on today’s strategic alignments this battle could be “right at the door.” The ancient prophecy of Psalm 83 was written by Asaph, a man the Bible refers to as a seer, perhaps gifted with the spirit of prophecy. Did Asaph leave a prophetic message for our generation? CLICK HERE TO WATCH THE PROPHECY IN THE NEWS TV INTERVIEWS OF BILL SALUS ON PSALM 83. Recognize any of those ancient places? Bill does a great job of identifying each of those countries in their present state and revealing their prophetic fate. Egypt holds particular interest for Prophecy in the News readers. Some months ago Gary wrote about the Egyptian Tower of Syene and the catastrophic destruction that makes Egypt uninhabitable for 40 years. Bill addresses the future of Egypt and why the Lord has singled them out to become the “lowliest of nations.” And no, we don’t believe the rapture is 40 years away! Nor does Bill! Iran is another nation God deals with in a sudden and unpleasant way. Will Israel attack Iran’s nuclear reactors in the near future and will this render parts of Iran uninhabitable as well? Bill puts forth some suggestions from the pages of Jeremiah that will make you think there could be an attack coming in the days ahead. Today, most prophecy-watchers are on high alert. Israel is threatened by enemies on all sides. The Muslim Brotherhood has taken control of entire countries, seemingly overnight. Iranian madman, Mahmoud Ahmadinejad, calls for Israel’s complete destruction. Vladimir Putin cozies up to Syria and their increasingly desperate despot, who still clings to power. Enemies and massive weaponry are everywhere—Palestinians, Hezbollah, Hamas . . . bombs, missiles and rockets . . . how much longer can it be before we have a deadly nuclear confrontation? Bill Salus believes it won’t be much longer. Remember 1991? Many students of prophecy got interested in the Old Testament prophets when Saddam Hussein began beating the war drum. Charles Dyer published a book before the war broke out, The Rise of Babylon, complete with the Butcher of Baghdad on the cover. I suppose he sold a few million copies of that book! Psalm 83 could easily follow in those footsteps in the days ahead. This whole series of future battles is like a gigantic jigsaw puzzle. Finding all the pieces and getting them into the right places takes time and effort. We all want to know—when will the Psalm 83 war take place? Is it before or after the Rapture? Is it before or after the Tribulation? Is it connected to Gog and Magog? Or the Battle of Armageddon? Are these battles intertwined and will Psalm 83 lead to the destruction of Damascus in Isaiah 17? Is Psalm 83 the hook in the jaw that lures Russia, Iran and their Islamic confederates down from the North? These are complicated questions for most theologians, but Bill believes he has it all figured out—and all the pieces seem to fit! Salus puts the Islamic Antichrist theory to rest as he shows the future destruction that awaits the Islamic nations. His comparison of Psalm 83 and Ezekiel 38 was enlightening, clearly showing that these two battles are separate events. And his detailed analysis of the little-known prophecy of Ezekiel 35 and the writings of Obadiah were eye-opening. This is a book that prophecy lovers will simply devour. The Psalm 83 war draws near. This book provides a roadmap for some of the things coming our way. Use it to learn about the Bible’s advanced knowledge of future events, long before the rest of the world knows what’s happened. When this war breaks out you won’t be able to find this book anywhere, so get your education now.